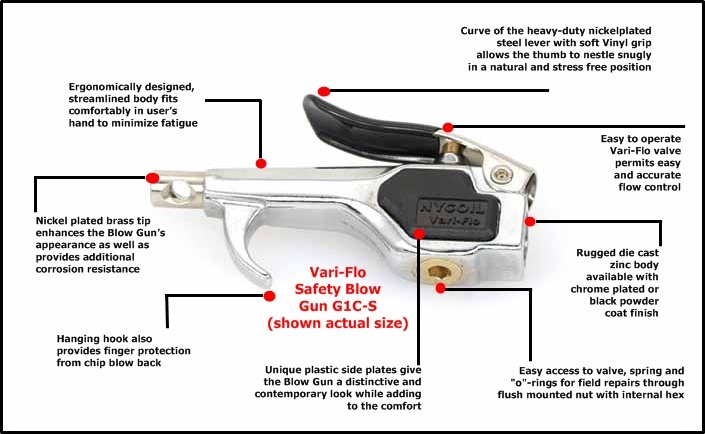 G1 Series, This Vari-Flo Body lever operated Blow Gun is uniquely designed to combine a contemporary appearance with unmatched performance. It features a zinc die cast body, nickel plated steel lever with a vinyl thumb grip, plastic side plates, stainless steel spring, repairable (replaceable) brass valve and Buna-N seals. Not only does this Blow Gun fit comfortably in the user's hand, it allows the amount of air flow to be controlled by how far the lever is depressed. Also can be used for water applications - especially good for controlling flow rate. The recessed internal hex screw allows easy access to valve assembly for repairs or replacement. Available with a chrome plated or black powder coat finish. This Blow Gun is available in two configurations: with 1/8" female NPT outlet port to accommodate various tips or with a nickel plated brass tamper proof fixed safety tip that is permanently attached to the Blow Gun body.